I love New Orleans – the architecture, the river, the beads, the culture, the music and most importantly the food. 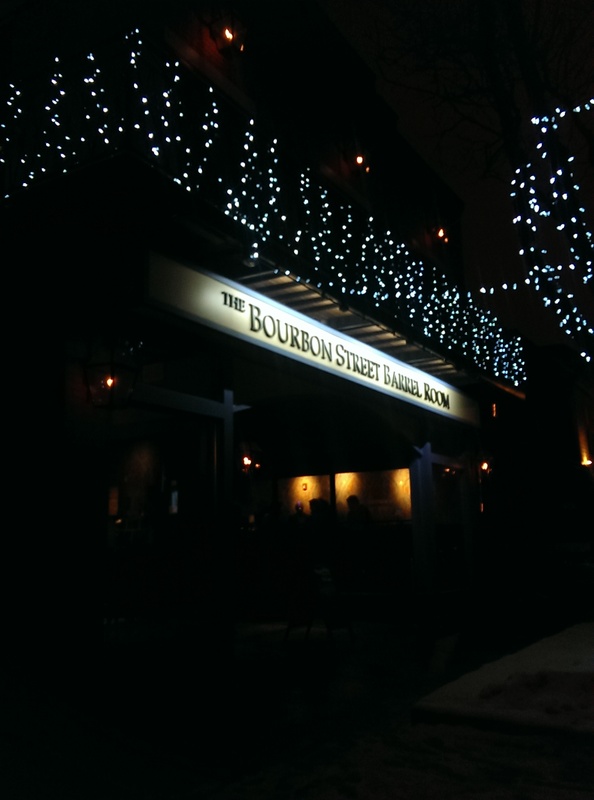 The Bourbon Street Barrel Room opened in Tremont just before Christmas, and I have been meaning to get there ever since. 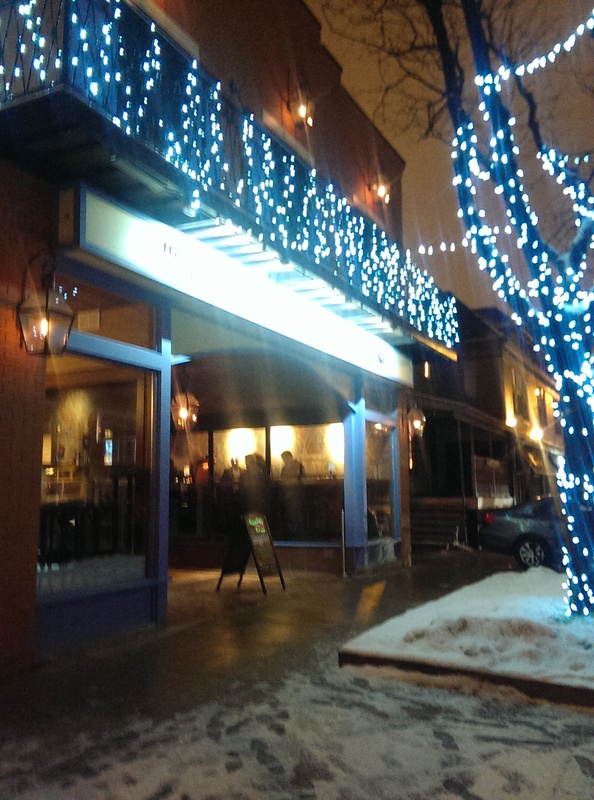 I had my chance the other night, when I met a bunch of foodie friends there for dinner on a cold, snowy January evening. I had a vague idea where it was since I had been to the art studio it had been in a previous life. It is located on Professor Avenue next to Fahrenheit. I parked on the cross street just past Ty Fun and carefully made my way down the icy sidewalk. The blue twinkle lights and light shining out of the sign and front windows were a warm, welcoming sight. Can I just say that the art studio was a total pit (water leaking out of the walls, cracked concrete, terrifyingly narrow stairs with a tiny metal railing leading down into the bowels) and that they have done AMAZING things to the space. The restaurant features lots of wood, chandeliers and tile ceilings and has a second floor circling the main area that is reminiscent of New Orlean’s latticework balconies. It is very impressive. I wasn’t a big fan of their seating policy. 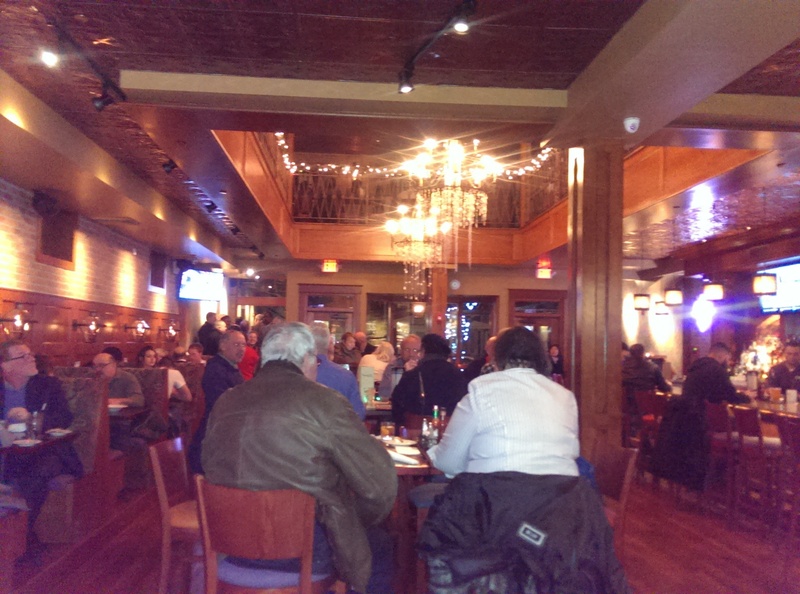 They don’t take reservations after 6 PM – even for a table of 11 – and would only seat us once 75% of our party showed up. We stood awkwardly at the bar waiting for the majority of the group to get there. At least I got to watch them make 5 hurricanes at once, so I had a good idea what was in them. We ended up getting a seat in the back of the restaurant near the kitchen. It was not as cozy as upstairs and was kind of loud, but we got the food really quickly and it was nice and hot. Their happy hour runs from 2 to 7 PM every night, and it features $1 off most of their appetizers as well as $1 off their Abita draft beers, house wines and hurricanes. I started off the evening with a hurricane because I love them. I chose the regular hurricane instead of the top-shelf Category 5 Hurricane because I knew I was driving in snow later. 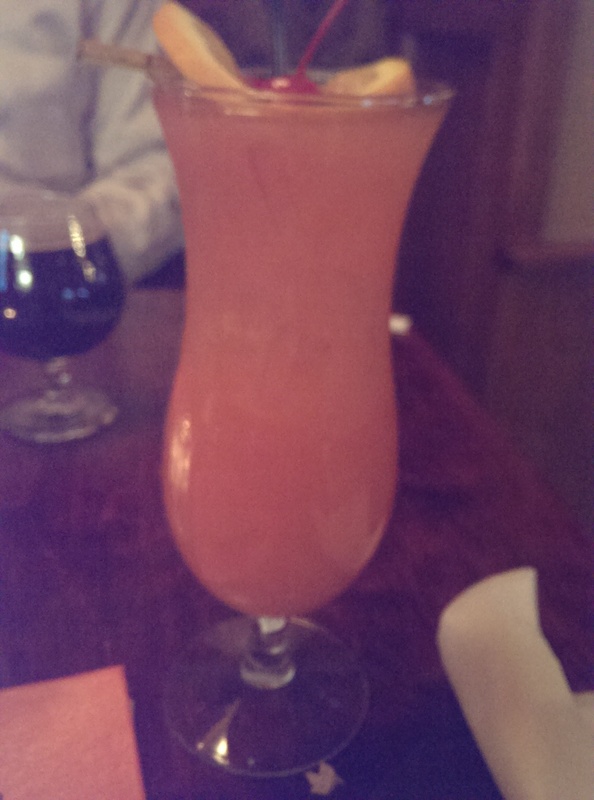 The regular hurricane was delicious. You could really taste all the fruit juices they used. I would go back in a second for drinks. I had a tough time deciding what to order because it all sounded good. I ended up ordering a small order of Hot Legs (frog legs with hot sauce) and the Jean Lafitte shrimp and catfish combo. It was a lot of fried food, so I ordered a side of greens once the food came out and I saw there was no greenery or plate dressing. The Hot Legs were very tangy from the hot sauce, and the frog meat was moist and tender. 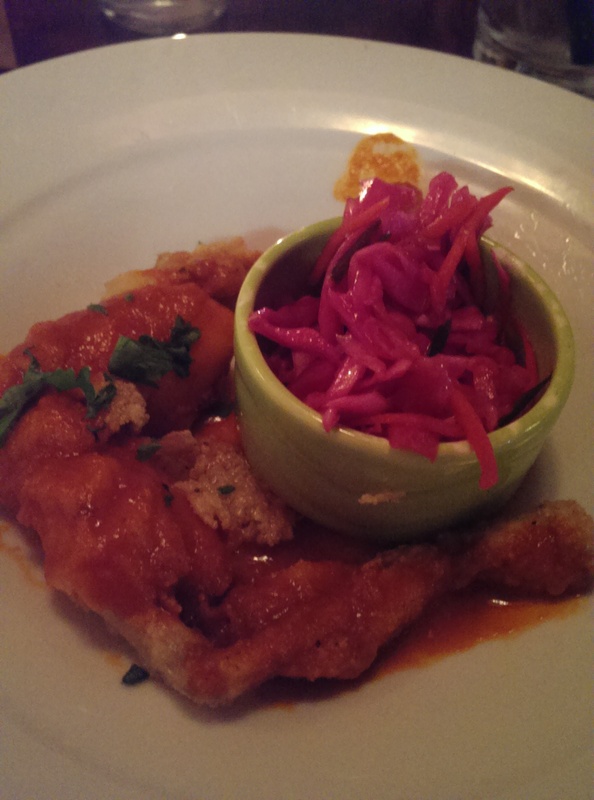 The frog legs were delicately breaded and fried. I had a bit of trouble with the small bones in the leg. The meat was so tender it fell off the bone fairly easily, but the bones also separated easily. The hot sauce was not as overpowering as I thought it would be, and I have to say I liked it. The slaw that accompanied it was nothing special, but it did a good job cutting the heat. I had one of my friend’s Hot Rocks (fried shrimp) and they were also really good. The Ragin’ Cajun Brochettes looked delicious as well. They feature Andouille sausage, vegetables, and pineapple on sugar cane skewers. They were very well received. 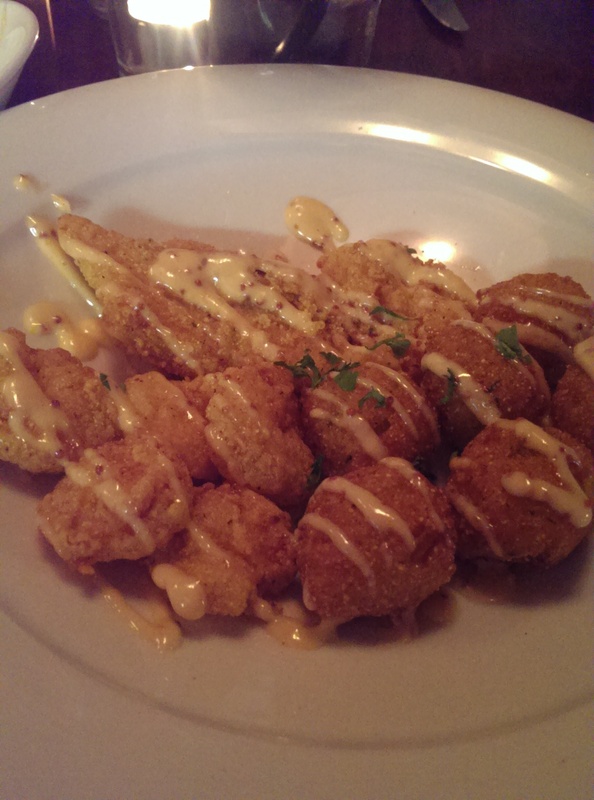 The Jean Lafitte shrimp and catfish combo came with a choice of hush puppies or French fries. I ordered the hush puppies and was so glad I did. These little corn bread nuggets were delicious – not too dense and had a nice flavor to them. The shrimp and catfish were nicely fried as well. 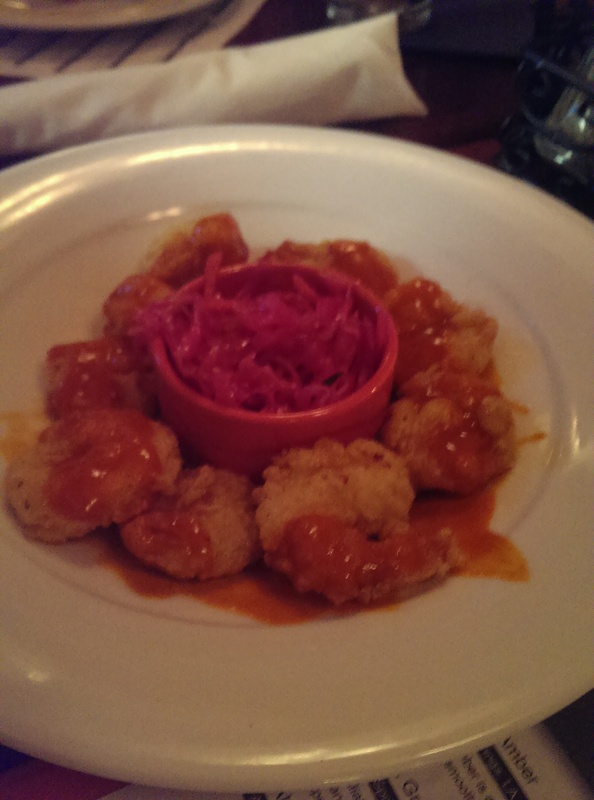 The shrimp was the same shrimp as the Hot Rocks but with a different dressing drizzled over them. The catfish was moist and tender and flaked easily with my fork. The citrus slaw that was supposed to accompany it was nowhere to be seen. Overall it was a little boring, but they certainly tasted good. 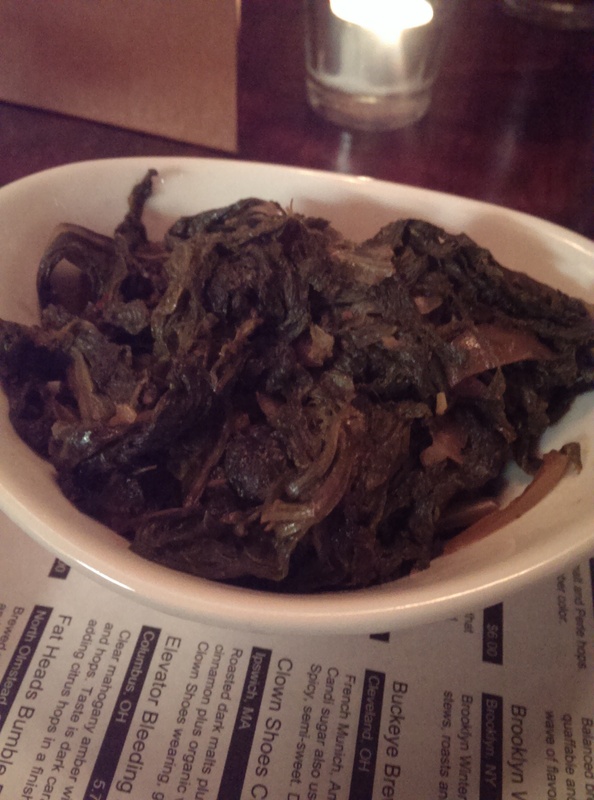 The braised greens were very vinegary. I prefer Angie’s Soul Food’s greens over these. They were a little mushy and the vinegar was very overpowering. One of my friends loved it, and she explained that she loves dousing fries in malt vinegar and loves vinegar. As for me, I had a few bites and took them home. I will probably add them to a fried rice, but I might also just toss them. They didn’t wow me. Next time I’ll order a side salad. I couldn’t go to the BSBR and not order the beignets for dessert. They were hot out of the fryer and topped with powdered sugar and some fresh berries. I shared them with the table since I was pretty full, and they were a hit. 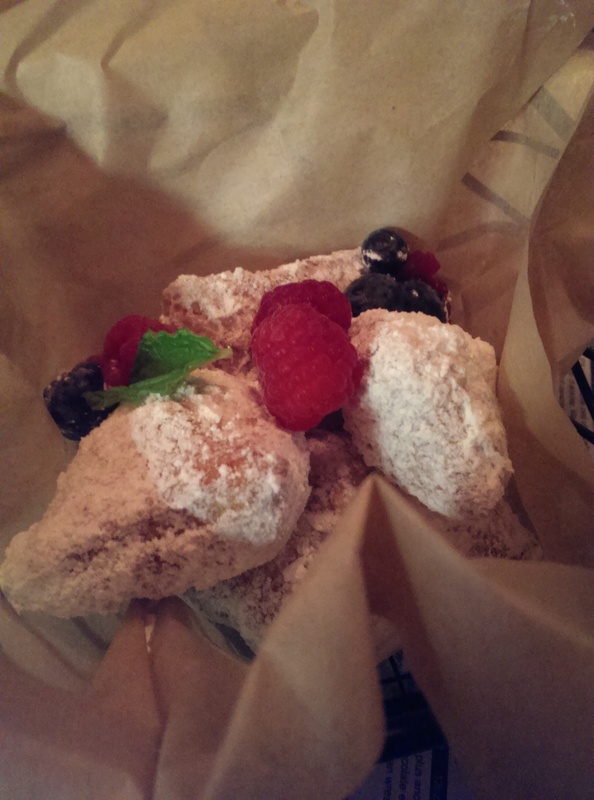 They weren’t as light and fluffy as the beignets I have had in New Orleans, but they were certainly a good choice. One of my other friends ordered the bread pudding and sent it around the table to taste. It was OUTSTANDING. The bread was the perfect custardy consistency, and the sauce was flavorful. I want to go back just for the bread pudding and hurricanes. I would probably give the place 3 thumbs up out of 5. Our server was great and handled our large table like a boss. However, the food was good but not outstanding. One diner wasn’t that enthused about the BBQ shrimp and grits, and the buns from the Po’ Boys were a lot of bread. One friend ate the catfish and left most of the bread behind. Another friend ordered the Muffaletta, and it came on a small baguette cut diagonally. It looked really good, and he appeared to enjoy it. 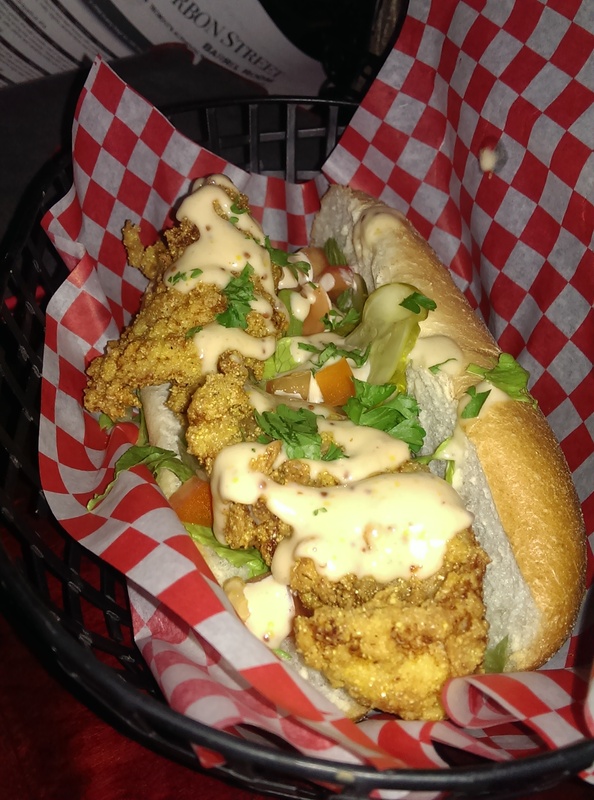 Maybe they should use the baguette for the Po’ Boys. I’ll be back to try more things off the menu like the shrimp cocktail, lump blue crab cakes, Voodoo Mama (Red Beans, Braised Greens, Smoked Sausage & Steamed Brown Rice) and the Crawfish Etouffee. And of course I need to try out their New Orleans brunch on Sundays from 10-3. If you haven’t been yet, you should check it out.